Is the end of HR on the horizon? Carter, despite her transition back to police officer, put her detective and investigative skills into high gear to try this week to try and bring down the corrupt New York cops and the Head of HR, Alonzo Quinn. And if the Russians were defeated as well, two birds with one stone isn’t half bad. Ever since the start of Person of Interest Season 3, Carter drifted back from helping Reese and Finch with the Machine’s numbers and took her time getting the evidence and proof she needed against HR. It was a smart move for the series, one that continues to grow and evolve like the Machine itself. It illustrated not only the importance of her character, but her ability and skills to work without Reese and Finch. She can be just as determined, smart and calculating as the two leads, rather than just a shadow that follows their orders or shows up when they need it. Plus, it’s remarkable to see how far Carter has come since Person of Interest Season 1. She was one of the weaker aspects back then, but the series has given time to create some personality and definitely a character that’s more than just one dimensional. And while she’s never been my favorite character, Person of Interest Season 3 Episode 8 proved not only that her taking the core focus of an episode worked (and I wasn’t bored), that she has a badass side and a loving side, but can definitely play in the big leagues and know when it's necessary to call in for some kneecapping backup. At the same time, incorporating relevant backstory that explored her past relationship with her child’s father was equally effective. Clearly, it was a tumultuous one, but her care and concern for both him and her son proved to have a positive effect in the long run. It is funny on shows like this how those minor characters can suddenly disappear forever only to pop up when you forgot they even existed, but it was good to see her son was safe. I do wonder how much we will see of the father now, though. Carter definitely deserved major credit for pulling the strings throughout the hour, and it was kind of crazy that her actions caused all those numbers to appear and give Reese and Finch a headache. Not to mention them trying to track her down. Sure, she had a little help from her “friend” Elias (who I keep waiting for him to rise back up) in starting a war between the former partners the Russians and HR. It was a brilliant move that could have landed her in hot water or worse… dead. But even in the span of the hour, Carter was able to grow beyond her necessity to carry out her task of avenging Cal Beecher and destroying HR all on her own. She was able to smartly recognize the power in numbers, friends and a man in a suit who knows how to expertly fire his weapon. Although, her “adopting” Reese’s style of robbing the Russians with his grenade launcher and gas mask by herself was pretty cool. It was even funny when Finch immediately suspected Shaw. 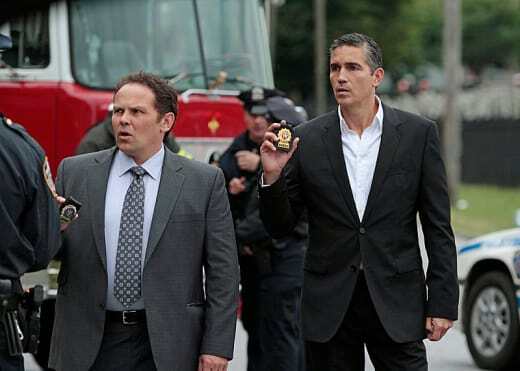 I’ve been missing Fusco and hope maybe he can get an episode soon that focuses more on him, but I was pleased in seeing him bond with Carter and further establish their connection as partners. She gave him the key to all the evidence, not Reese or Finch. He was even willing to drop everything and help her out, even if she ended up ditching him. “Engame” was a very good Carter-centered episode and really allowed Taraji P. Henson to shine without providing anything melodramatic or overly unbelievable for her character. It was a good payoff for what Person of Interest Season 3 has been building for her. I just hope that Simmons and his call to everyone to take down the “Man in the Suit” at the end doesn’t lead to unfortunate consequences after all her hard work. It’s obvious that HR isn’t going down with at least one more fight.